Babymoov Lovenest Baby Pillow - Original Bl..
Lovenest +: a baby pillow for more comfort and safety! 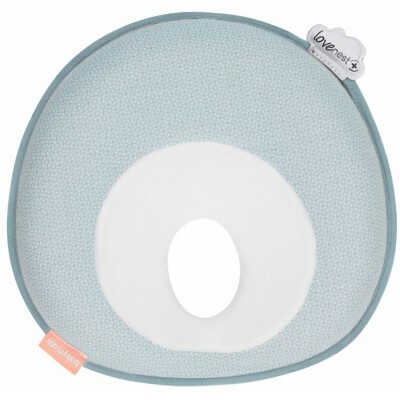 Using technology developed by French paediatrician Dr Manuel Maidenberg, the Lovenest+ is an ergonomic head support that keeps baby’s head nice and round. Its angle of incline and special shape are suited to the shape of an infant’s skull, while at the same time ensuring an even distribution of pressure across baby’s head. The Lovenest+ also offers real support without restricting freedom of movement. With its antibacterial, thermoregulating Coolmax® fabric, it adapts to baby’s temperature for perfect comfort.